Eugène Lamy, Paris (gift from the artist). Mme Blanche Drouilly (née Lamy), Paris (by descent from the above). Private collection, Paris (by descent from the above); sale, Christie's, London, 26 June 1990, lot 235. M. Berhaut, Caillebotte, Sa vie et son oeuvre, Catalogue raisonné des peintures et pastels, Paris, 1978, p. 195, no. 338. M. Lucas and M. de Yerres, Un yerrois célèbre, de 1860 à 1879, Gustave Caillebotte, Paris, 1994, p. 51 (illustrated in color). M.-A. Anquetil, "Caillebotte," Dossier de L'Art, September 1994, p. 68 (illustrated in color). M. Berhaut, Gustave Caillebotte, Catalogue raisonné des peintures et pastels, Paris, 1994, p. 218, no. 394 (illustrated). Paris, Galerie Beaux-Arts, Rétrospective Gustave Caillebotte, 1951, no. 64. Kunsthalle Bremen, Uber das Wasser, Gustave Caillbotte, June-October 2008, p. 104, no. 48 (illustrated in color; dated 1888-1889). The Comité Caillebotte has confirmed the authenticity of this work. Portrait d'Eugéne Lamy is one of two oil portraits Gustave Caillebotte painted of his close friend and sailing partner between 1888 and 1889. They likely met sailing at the Bassin d'Argenteuil near Petit Gennevilliers, where Caillebotte had purchased a home in 1881. Caillebotte also painted Eugéne's wife Blanche Lamy twice. On moving to Petit Gennevilliers permanently in 1888, Caillebotte's art flourished. Rather than focusing on urban scenes as in his earlier works, he now explored nature, and especially the contrast between nature and engineering. 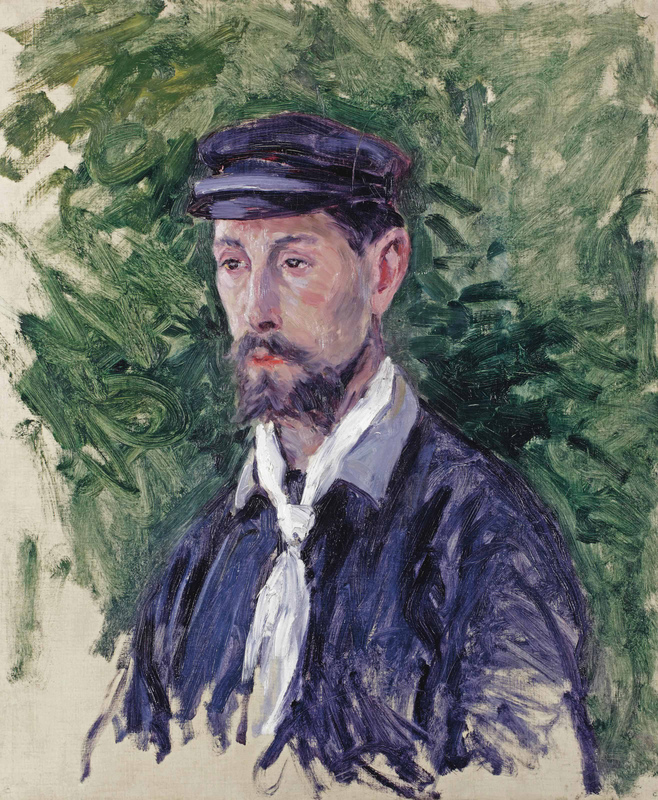 Along with painting, Caillebotte devoted himself to gardening and to building and racing yachts, a passion he shared with Lamy. The dabbed application of the paint in Portrait d'Eugéne Lamy and the hatched brushstrokes document a frenzy of activity on the artist's part. The style speaks of the influence of Renoir, as do the work's flesh-tones. Renoir and Caillebotte had been friends for years by this time--Caillebotte was even the godfather of one of Renoir's sons. And Renoir was a frequent visitor at Petit-Gennevilliers, where the two painters engaged in far-ranging discussions on art, politics, literature, and philosophy. It was in the relative seclusion of the verdant Petit Gennevilliers, though, that Renoir's influence began truly to reveal itself in Caillebotte's works. When it came to selecting his sources and influences, Caillebotte had a great advantage in that he owned so many works by his fellow Impressionists. With a particularly diverse collection of Renoirs. Maintaining a distance from Paris and the Impressionist factions, Caillebotte could pick and choose his influences from the walls of his house.